Strandgade in Christianshavn is one of Copenhagen's most beautiful streets, with numerous buildings from the 17th and 18th centuries. When King Christian IV founded this part of the city in 1618, he encouraged well-heeled people to build on the east side of the street. Copenhagen's mayor, Mikkel Vibe, was the most famous. He built numbers 30-32. The facade is still decorated with the remains of the original renaissance features, including intertwined sandstone borders and connecting arches above the windows. Christianshavn still has many well-preserved houses because the quarter avoided the fires that hit Copenhagen. Several large properties were added in the 18th century. Christianshavn flourished in the absolute monarchy of the 18th century, and Copenhagen's merchants kept themselves busy building impressive properties in the new quarter. 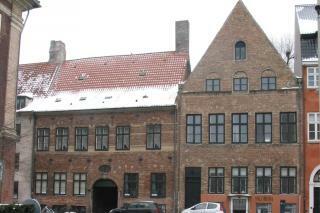 A number of Denmark's most famous merchants settled on the eastern side of Strandgade. One of them was Niels Brock, who ran his very successful business from number 36. Wealthy wine merchant Abraham Lehn made a home for himself at Strandgade 6. On the west side, traders built warehouses facing out to sea and the harbour. This was where The Danish Asiatic Company had its headquarters, and where Copenhageners could buy Eastern goods shipped home from China by the company's fleet. Eigtveds Pakhus from 1748-50 is especially famous. Gysbert Behagen, one of the company directors, hadn't far to go to work. He lived in the red house at number 26 on the other side of the street.